Airport-style scanners are to be introduced at railway stations in Essex in an effort to deter armed criminals from travelling by train in the county. Portable x-ray machines and metal detectors will be randomly placed at stations to catch anyone carrying weapons. 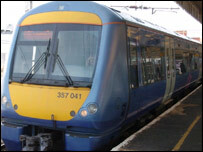 Essex Police, British Transport Police and c2c Rail are launching the joint operation which will last all summer. It follows trials at underground stations in London. Some portable metal detectors will also by carried by officers on trains. Essex Police Supt Steve Bottrill said: "Thieves and other criminals who are intent on carrying knives have had the opportunity to dispose of them as part of the current amnesty. "If they don't wish to take the opportunity, they risk prosecution or even prison. "The over ground and underground lines running into Essex will be flooded with both uniformed officers and plain-clothed staff to reduce crime and the fear of crime." Could rail passenger screening work?